We also provide self-service check-in approaches. All local citizens are recommended to use our KIOSK to check-in and select your seat on their own. Customers with confirmed booking and e-ticket association are eligible for our web check-in service. Please click for details. All passengers are required to present at check-in counter an identity document containing a photo and the name in the document must be the same as the one on your flight ticket. The “Identity Document” can be any identity documents containing a photo issued by a domestic or foreign government, such as the citizen ID card, NHI card, driver’s license, and passport. A household register or an transcript of household registration can serve as an identity document for minors under 14 years old. In case of any changes of regulations, the current aviation police regulations shall prevail. You can buy flight tickets at our check-in counter by cash (local currency only) or with credit card. Using expired, invalid or forged identity documents to buy a discount ticket is an illegal act. Please do not break the law. To protect the rights and interests of credit card holders, passengers who buy tickets over the phone from our reservation center or electronic tickets over the internet should present the credit card you use in the to complete check-in. If you buy tickets for your friends and relatives with your credit card, please sign the form “Electronic Ticket Payment Confirmation” and hand it over to our counter staff for verification. You can select a seat when you check in. We handle seat selecting according to the “first come first serve” policy. However, in consideration of the aircraft weight and balance and flight safety, we may not be able to fulfill all of your requirements in some situations. Please understand and cooperate. 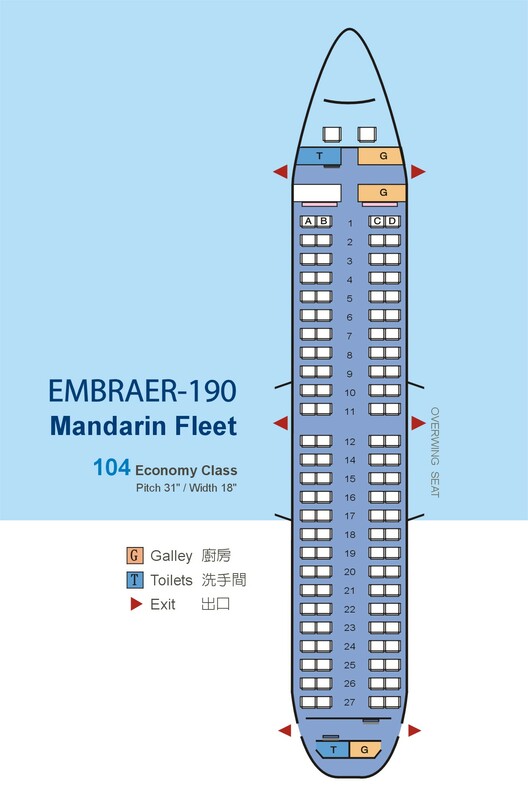 Please refer to the seat map for details regarding the cabin layout. Definition: “Exit Row Seats” refer to seats with direct access to an emergency exit without penetrating the aisle or partition. The emergency exit seats of some aircraft are the first choice of frequent travelers as they have more leg space. To maintain cabin safety and abide by the civil aviation laws and regulations, we must confirm the eligibility of passengers before arranging these seats for you. For passengers to be arranged in the exit seat row, our counter staff will briefly explain to you the requirements for exit row seats. You must meet the following selection criteria, agree with such requirements, and provide the assistance in the event of an emergency as requested by cabin crew. After boarding, cabin crew will also brief these requirements to you. Should you have any doubts or unwilling to sit in these seats, you can express your intention, and we will immediately change a seat for you. Please refer to the “Exit Row Seats Requirements” for detailed information. For passengers completing check-in and security check, please proceed to the waiting lounge and locate your boarding gate at least 15 minutes before flight departure. In addition, please show your identity documents and boarding pass for examination upon boarding. Before boarding, we will make a boarding announcement and ask passengers with special needs (e.g., passengers using a wheelchair) or infants to board first. To maintain boarding gate clearance, please take our advice and follow the queue line to go through our boarding control. In compliance of safety requirements, please follow our instruction to adjust your personal electronic devices while boarding. We will help you to check in your carryon if it is too large or too heavy to be accommodated in the cabin baggage compartment. Excess baggage charge shall be collected if it exceeds your free baggage allowance. When a flight is fully booked, you may be asked to put your name on a waiting list. You will be advised when to open listing at check-in counter. All waiting-list passengers are valid only on one day and one airport. If there are many flights for the same route, you only need to fill in the waiting list once. Members of the Dynasty Flyer Paragon Card, Emerald Card, and Gold Card should specify the type of card they hold in the “Card Type” column and show their cards when waiting for a flight to maintain their priority rights (waiting priorities: Dynasty Flyer Paragon Card, Dynasty Flyer Emerald Card, and Dynasty Flyer Gold Card). Please go to the counter to wait for the roll call 20 minutes before the flight departure time or after you hear the announcement. Passengers who do not respond after three calls will be considered as giving up their rights. If these passengers wish to be wait-listed again, they must fill their names in the waiting list again. We decline temporary custody of any items (including the items deemed dangerous for flight) for passengers to prevent customer complaints and subsequent compensation derived from missing items. Including baggage carried in the cabin, including carry-on spinners, boarding bags, and garment bags. Regardless of aircraft types, each passenger can carry one piece of hand baggage not exceeding the following dimensions 56cm x 36cm x 23cm and weight not exceeding 7kg or 15 pounds. Customers with baggage exceeding the size or weight of the above standard shall be asked to check in at gate. In case of any items which are required to be removed from your carry-on baggage during security check process, Mandarin Airlines shall not be responsible for any custody or return of these items. Small-size baggage that passengers carry as personal belongings for use in a journey will not be considered carry-on baggage. These items include: purses, handbags, overcoats, blankets, umbrellas, ordinary cameras, binoculars, readers in a journey, small-size duty-free items, laptops, milk bottles and baby food for feeding infants during flight. These items can be placed in the pocket in front of your seat, provided that they must not exceeds the top of seatback and will not come out of the pocket in a normal and emergency situation to prevent blocking the aisle in an emergency evacuation. Items for special personal needs that must be carried on must be placed in the authorized area (such as the space underneath a seat or the overhead bin). The number of special items will not be counted in the carry-on baggage. If a special item is too big to place underneath the seat or in the overhead bin, we will ask you to check in before flight. (1)You can put it in the overhead bin or underneath the seat. (2)Please do not block the exits or aisles. (1)When putting them in the cabin, they must comply with the dangerous goods handling principles of Mandarin Airlines. (2)You can contact our Customer Service Call center to check if your medical instrument is allowed to use during flight. 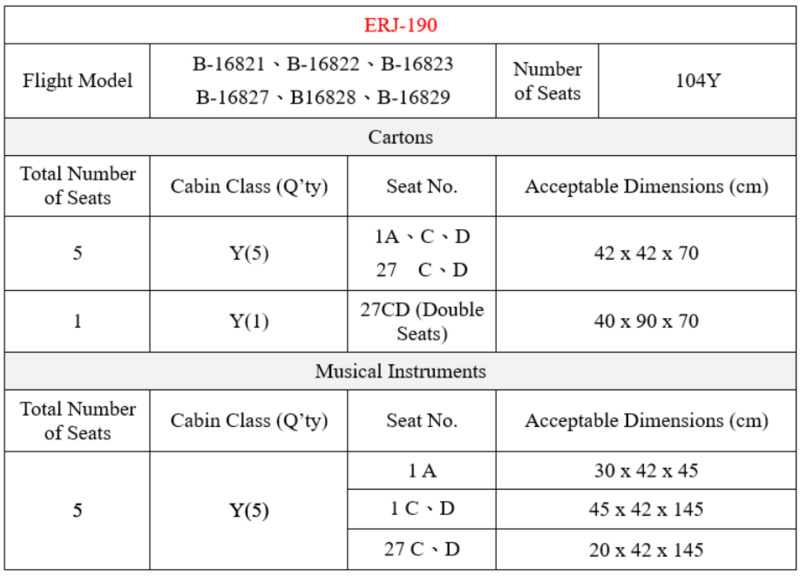 (3)If you need to put it on a seat, please follow the Cabin Seat Baggage (CBBG) instructions. (1)Please do not use any cots on our flights. (2)Please check in the cot if it is unable to put inside the above locations or there is not enough space. To maintain service quality and the rights and interests of other passengers, please do not carry on or check in items disseminating unpleasant smells (such as durian). (1)To prevent fragile items from breaking in the cabin to injure other passengers or affect flight safety, please do not carry any fragile items without proper package into cabin. •Do not carry or check in alcoholic beverages over 70% v/v. •When carrying alcoholic beverages between 24-70% v/v, each pack shall not exceed 5 liters. •Each passenger can only carry or check in no more than 5 liters of alcoholic beverages. •If it is unable to put inside the above locations or there is not enough space and a passenger must check in such items, he/she must sign the “Release and Waiver of Liability” to take full responsibility for their damage. If it is unable to put inside the above locations or there is not enough space, please follow the CBBG instructions. Or, we will arrange the checked baggage service for you and put them in the cargo hold. When the total weight of your checked baggage exceeds your baggage allowance, you will need to pay the excess baggage charge. If the package cannot be fixed by a seatbelt, or a passenger has doubts in our tying method, or the item exceeds the acceptable dimensions, they will be treated as CBBG. In addition, this company reserves the right to refuse transporting such items. CBBG: A large item that a passenger must buy a ticket to carry it on the cabin and must be tied on a cabin seat. Please book an additional seat 48 hours before flight departure and complete the “Cabin Seat Baggage Letter of Intent: ERJ Model”. After completing the form, please fax it to the departure airport. Passengers must complete the check-in procedure 75 minutes before departure for international flights and 45 minutes before departure for domestic flights. a.Passengers shall properly pack CBBG with non-glass materials. b.Each seat can accommodate one complete packaged CBBG. If the width of CBBG exceeds the width of a seat, passengers may buy tickets for a maximum of 2 seats for each piece of CBBG. c.To prevent the item from moving during flight, we will securely fix the item. d.Do not place the item close to or on the emergency exit aisle or the aisle of other cabins. e.Do not block the sight of other passengers and make sure that other passengers can read the seatbelt, no smoking, and exit signs. f.CBBG shall not contain dangerous goods and shall comply with the aviation security requirements (if accessories such as crescent blades, swords, or ritual implements may cause security doubts, passengers shall remove them or put them in the cargo hold). g.Do not change the CBBG seat(s) in a journey. CBBG must leave the plane the last after the flight arrives at the airport. Do not put spare lithium batteries, power banks, safety matches, or lighters in checked baggage. Each passenger enjoys a free baggage allowance up to 10kg for domestic flights. For baggage exceeding 10kg, passengers will need to pay an excess baggage charge based on our cargo transportation rate. Please refer to theCargo Ratesfor details. We strongly recommend that each piece of checked baggage not exceed 32kg to prevent airport baggage handling personnel from occupational injuries. For domestic flights, the passenger check-in counter is separated from the one for baggage. Please show your boarding pass and identity documents when checking in your baggage. Please do not check in baggage for strangers or let strangers to check in baggage for you. We strongly recommend you to pack your baggage and complete the check-in procedure by yourself. Please keep your baggage receipt properly as evidence to claim your baggage. We will retrieve it while we return baggage to you. If you lost your baggage tag, please prepare the stud of your boarding card and identity documents to contact our service staff. We recommend you to properly pack and lock your checked baggage and put your contact information on the baggage. We have prepared contact information labels at the baggage check-in counter for you to use. Please do not put the following items in the checked baggage: valuable items, perishable items, fragile items, securities, cash, jewelry, passports and other identity documents. If you lost any items in the checked baggage, we assume no responsibility to compensate the loss or damage items inside the checked baggage. Please kindly check your baggage size before check-in. We can only accept baggage if its sum of dimension (length, width, height) does not exceed 152 cm. The following items are treated as special baggage due to large size which may take more loading space: bicycle, surf/windsurfing board, and battery-powered wheelchair. Please advise our customer service center of special baggage size/dimensions (after packing) and weight no less than 48 hours before your flight scheduled departure time in case such special baggage is to carried to flight. Your request shall be processed immediately to check whether such baggage can be accommodated in our aircraft cargo compartment. Please repack your baggage if its weight is heavier than 32 kg. As the aircraft cargo compartment has limited capacity, the quantity allowed for acceptance is also limited. Please definitely contact our customer service center in advance to confirm. Special baggage must be properly packed to protect itself and other baggage from damage. 1. The package shall be able to render protection. Bicycle handle shall be turned 90 degrees to be fixed and pedals shall be turned inward and fixed. 2. Tires must be deflated. 4. The dimensions of each (length, width, and height) shall not exceed 160*40*143 cm. 1. Please load surf board in the specific bag or any package which contain protection sole. When a specific bag is applied for loading, such a bag is allowed to take 2 boards only. Proper package can prevent your surf boards from scratch, dent, or other damage. 2. Each wind surfing package can contain a board, mast, boom, and sail. The package shall be able to give protection as well. 1.Mandarin Airlines provide free wheelchair service for passengers with low mobility. In case of battery-powered wheelchair check-in request, please definitely contact our customer service center in advance. 2. Please also check below table which gives size wise for your special size baggage. Except for the indemnification terms in the standard agreement, we assumes no responsibility for any compensation resulted from the loss or destruction of the following items in a journey, except when you have declared the excess value or you can prove that the loss or destruction of such items is caused by the willful or pure negligence of us. However, we reserve the right to refuse the declaration of valuable items or personal items with excess value. With reference to the Civil Aeronautics Agency (CAA) of the Republic of China, the following items are strictly prohibited in carry-on, hand-carry, or checked baggage to ensure aviation safety. This company does not allow passengers to carry any dangerous goods on the plane. Please refer to the Tablefor the items the flight crew and passengers can carry on the flight or in the checked baggage. The package shall be able to render protection. Bicycle handle shall be turned 90 degrees to be fixed and pedals shall be turned inward and fixed. Tires must be deflated. Any high-pressured cylinders are declined for flight. The dimensions of each (length, width, and height) shall not exceed 160*40*43 cm. No pet is allowed in the passenger cabin, except for guide dogs. However, passengers can check in their pets as baggage at the cargo transportation rates. Pets less than 10kg of weight (including cage) are charged at 10kg. We only accept ordinary pets (e.g., dogs, cats, rabbits, turtles, frogs, and others). We do not accept poultry, birds, rodents, assaultive animals, pregnant animals, and newborn pets requiring milk, flat-nosed cats and dogs, and so on. Pets as baggage t must be clean and healthy without any unpleasant smell. Passengers consigning pets must prepare a safe, clean,and robust pet cage. a. A cage must be safe and robust. The door must be latched and cannot be opened to prevent animals from escape due to fright. b. The size of a cage must be suitable for the animal to stand up, turn around, and lie down (the length or width must not exceed 70cm and height 89cm). c. No water or food inside the cage. d. The cage bottom must not scratch the cargo hold floor. Passengers should prepare a tray to contain the droppings of animals. Passengers consigning a pet must sign the「Release and Waiver of Liability」. If a pet is lost, injured, or dies during flight due to a health or personal problem or improper caging, we assumes no responsibility for compensation. a. Application form (to be completed on-site at the quarantine station in Kinmen, Matsu, and Penghu). Paintings, art works, antiques, cash, securities, transferable bills, optical products, wristwatches and clocks, and natural fur products. Jewelry, rare metals (minerals), silverware, collectibles, family heirlooms, and irreplaceable items. Video and audio equipment and relevant products, mobile phones, and other communication devices. Computer and IT hardware and software products, electronic IT equipment, and business equipment. Wines, keys, emergency medications, and medical instruments. Original works, design blue prints, photos, publications, and business (personal) documents. Business samples, video (audio) works. Passports and other identity documents. Other valuable items or commercial items. Protect spare lithium batteries and power banks against short circuit individually and do not put them in checked baggage. Items without airline approval: Portable electronic devices for personal use (e.g., watches, mobile phones, and cameras). Items required for airline approval: Spare lithium batteries at 100Wh-160Wh, not more than two in the carry-on baggage. Products using lithium batteries exceeding 160Wh (except for electrical walking assistive devices) are not allowed onboard a flight. The lithium battery contained in the following items shall comply with section 38.3, Part 3 of the UN’s “Manual of Tests and Criteria” and with the airline approval. a. Electric wheelchairs and other electrical walking assistive devices using lithium batteries. b. Equipment with a security device. c. Portable electronic medical devices. Explosives: Such as fireworks, firecrackers, and flares. Compressed gases: Such as gas tanks, diving cylinders, spray paints, insecticides, etc. Flammable items: Such as gasoline and diesel, paints, perfumes, etc. Oxidation items: Such as bleach (liquid or powder) and industrial hydrogen peroxide. Toxic substances and contagious items: Such as insecticides, herbicides, pesticides, activated filterable virus. Corrosive items: Such as concentrated acid, concentrated alkaline, mercury, and lead-acid batteries. Briefcases and small spinners with anti-theft devices. Tasers: Dangerous goods containing explosive pressured gases or lithium batteries. Other contrabands: Such as magnetized items (strong magnets and grounding speakers), irritable items (personal protection sprays), all kinds of guns and weapons (non-official uses). Liquid oxygen: Devices containing liquid oxygen are not allowed carry-on, hand-carry, or checked baggage. Items that may threaten aviation safety and cannot be carried on the aircraft in the carry-on baggage or by passengers and that must be carried in the checked baggage. Please refer to theTable for details. When baggage is lost, damaged or delayed after the flight arrives at the destination, passengers should make their claims to our staff before leaving the airport. a. Carry-on baggage: A personnel can claim compensation for damage caused by the negligence of Mandarin Airlines at a maximum of NT$20,000. b. Checked baggage: Calculated based on the actual damage, with a maximum of not more than NT$1,000/kg.